Nestled on the beach, this Hayman Island resort is just steps from Coral Sea and Hayman Island Reef. Hayman Island is probably the closest you’ll come to a real-life tropical paradise. A tiny island in Queensland’s Whitsundays, it’s the perfect place to indulge in a little romance or just unwind. You’ll stay in a luxury resort overlooking a white sandy beach lined with palm trees and surrounded by stunning blue sea. If that’s not enough to get your mouse clicking on our deals below, there’s also delightful dining, spa baths, fitness and water sports. Book your Hayman Island accommodation with us and give yourself the break you’ve been looking for. Hayman Island is the most northerly of the Whitsunday Islands, famous for its easy access to the Great Barrier Reef. Reginald Ansett, the founder of the famous Australian airline, bought the island in 1947. Three years later he opened the first Hayman Hotel, and in 1985 a $300-million project was launched to turn Hayman Island into a truly luxurious holiday destination. Now Hayman’s only resort has won a bunch of awards including Australasia’s Leading Family Resort three times! 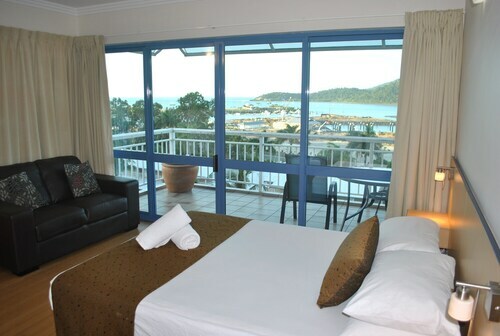 Hayman is just 400 hectares in size but has a range of landscapes from rainforest and mangroves to beaches and bush. On Hayman Island, you can relax on the beach or take a dip in the massive resort pool, or discover the Great Barrier Reef with a snorkel, scuba dive or seaplane adventure. Get into some water-sport fun with a tube ride, some wakeboarding or waterskiing. If you want to snorkel in a more secluded location, take a guided five-kilometre walk to Blue Pearl Bay and see its unique fish and coral. You can also appreciate the wonders of nature on dry land with a walk up to Southern Peak with sweeping views of some of the Whitsunday Islands. Hayman’s dining won’t disappoint you. Everything from buffet breakfasts to seafood and Mediterranean is, quite literally, on the table. You can even book a candlelit dinner for two on your terrace overlooking the ocean. Feel like leaving with some bargains? Then check out the resort’s range of boutique shopping. Getting to Hayman is easy. Just fly to the Great Barrier Reef Airport on Hamilton Island and book a luxury launch or seaplane transfer. You can also get a sea transfer direct from Airlie Beach. Wot else do you need to know? 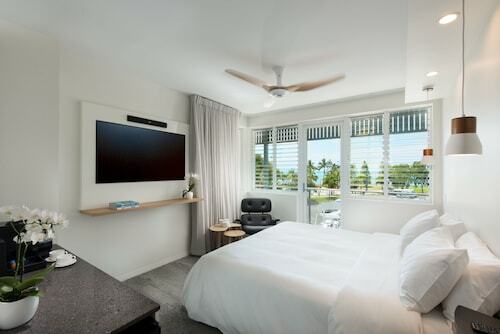 Book your Hayman Island accommodation with us and take it slow. Please note that Hayman is shutting down from 15 January – 13 June 2014 to renovate and re-open as One&Only Hayman Island. One and only, indeed! How Much is a Hotel Room in Hayman Island? Hotels in Hayman Island start at AU$195 per night. Prices and availability subject to change. Additional terms may apply.